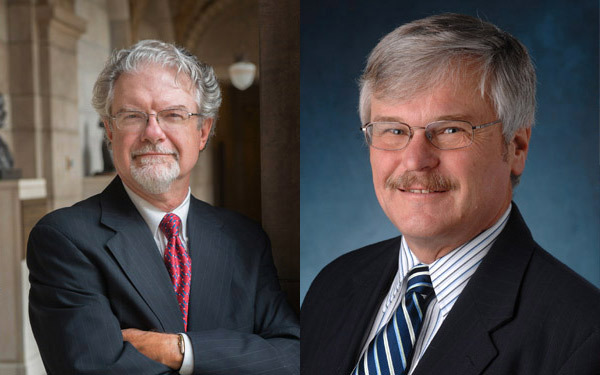 On November 28, the University of Nebraska hosted a dialogue on the death penalty with J. Kirk Brown (left), Nebraska's Solicitor General, and Professor Michael Radelet (right) of the University of Colorado. Mr. Kirk was the state's counsel of record for all of its executions since 1978. Prof. Radelet is a well-known death penalty expert, researcher, and the author of several works on innocence and the death penalty. The discussion was titled: “The Death Penalty: Justice, Retribution and Dollars” and explored whether the state should continue or abandon its death penalty. A video of the dialogue is available at this link. Since 1978, Nebraska has carried out three executions, but none since 1997. There are 11 inmates on the state's death row. Learn more about Nebraska's death penalty here. The Death Penalty Information Center offers many resources to help you stay informed of current death penalty news. We have just released our second weekly video podcast, summarizing important development from the week's news. A new video will be posted each Friday on our YouTube channel. You can also find these videos on our Facebook page, along with daily news updates and weekly infographics. Our Twitter and Google+ pages also link to daily news updates. If you prefer to receive a once-weekly update via email, you can sign up for our e-newsletter, which is sent out each Monday with the previous week's news. In addition to these web resources, we also offer a mobile app for iPhone, iPad, and iPod touch for easy access to our Fact Sheet, Execution Database, audio podcasts, and other information. Our high school curriculum is newly available as a free iBook for the iPad with touch-screen navigation, access to the full curriculum even when offline, and use of standard iBook features, such as instant word definitions and easy note-taking functions. This Fall the Culture Project is hosting a limited engagement of its award-winning production, The Exonerated. The play is a groundbreaking dramatization of the real-life stories of six death row inmates who were freed after being cleared of their capital charge. The production, which premiered a decade ago and traveled the country, is culled from interviews, letters, transcripts, case files, and court records. Former U.S. Attorney General Janet Reno described The Exonerated as follows: "What has been done tonight through this play is one of the most extraordinary events I have ever seen and it will do more to promote justice than any literary efforts I have seen. The play will feature a rotating cast of high-profile actors, including Stockard Channing, Brian Dennehy, Steve Earle, John Forté, K’naan, Delroy Lindo, Lyle Lovett, Chris Sarandon, and Brooke Shields. The presentation will also include a series of "Talk-Backs" with leading criminal justice experts, including Christina Swarns, NAACP Legal Defense Fund (October 16), Shari Silberstein, Executive Director of Equal Justice USA (October 24), and Stephen Bright, President, Southern Center for Human Rights (October 31). The Exonerated will run for seven weeks, beginning on September 15, at the Culture Project’s 45 Bleecker Street theater. MULTIMEDIA: "David R. Dow: Lessons from Death Row Inmates"
In the latest edition of the Death Penalty Information Center's podcasts, we interview attorney Jennifer Whitfield (pictured) of Covington & Burling, who worked to secure the release of former death row inmate Larry Smith in Alabama. Mr. Smith was sentenced to death in 1995 for a murder related to a robbery. His conviction hinged on a statement he made after 4 hours of interrogation. In violation of police guidelines, his interrogation was not recorded, and Mr. Smith later said his admission of involvement in the crime was coerced and influenced by threats made to prosecute his wife. No physical evidence or eyewitness account linked Mr. Smith to the murder, and a witness, who said Smith hatched a plan to rob the victim, was later implicated in planning the crime himself. In 2007, an Alabama Circuit Court ordered a retrial, and a plea deal was reached this year (April 6, 2012) that allowed Mr. Smith to be released after pleading guilty to conspiracy to commit robbery. The murder charges against him were dropped. In the podcast interview, Ms. Whitfield discusses the failures that led to Mr. Smith's conviction and how some of those problems, including inadequate representation and coerced confessions, affect the death penalty system at large. Listen to the podcast. A new video prepared with international support discusses the importance of foreign embassies lending support when citizens of their countries face the death penalty in the United States. According to Ambassador Joao Vale de Almedia, Head of the European Union Delegation to the U.S., “Foreign nationals are particularly vulnerable in death penalty cases. They’re most likely not to know the language perfectly, and certainly not know the way justice is administered in that particular country. So it’s only normal that they require particular attention and help.” Article 36 of the Vienna Convention for Consular Relations, a bi-lateral treaty that the U.S. has signed and ratified, requires that foreign nationals arrested in the United States (or elsewhere) be told of their right to communicate with their consulate for assistance. The video features Council of Europe Goodwill Ambassador Bianca Jagger, as well as Ambassador Almedia and other legal experts, who describe some of the problems that foreign citizens face in the justice system and how consular officials can be of assistance. There are about 136 foreign nationals on U.S. death rows from 37 different countries. Al Jazeera recently released a video of an interview with former Oklahoma death-row inmate Michael Selsor (pictured). Selsor was the most recent person executed in the U.S. and probably the inmate who served the longest time between conviction and execution of anyone in U.S. history. He was first sentenced to death in 1976 for murder and was imprisoned over 36 years prior to his execution on May 1, 2012. Although his sentence was reduced to life when Oklahoma's death penalty was overturned in 1976, he was re-sentenced to death for the same crime in 1998. The interview was conducted in 2010 and was the only interview Selsor granted. When asked about the difference between the death penalty and life without parole, Selsor said, “The only difference between death and life without parole is one you kill me now, the other one you kill me later. There's not even a shred of hope. There's no need to even try to muster up a seed of hope because you're just gonna die of old age in here....With the death penalty sentence I'm entitled to more appeals - the government's gonna pay for it. I don't have to do it myself if I don't have the money for a lawyer which I don't have. Instead I'm relying on public defenders to do my appeals." Selsor was also asked about how he was handling his inevitable execution: “I'm not gonna beg 'em to spare my life. I'll try to keep my head up with a little bit of dignity, and I'm gonna be buried out on Periwood Hill.” See the video of the interview. In the latest edition of the Death Penalty Information Center's podcasts, Professor Michael H. Fox, director of the Japan Innocence and Death Penalty Research Center, discusses the current state of the death penalty in Japan. Prof. Fox compares public opinion on the death penalty in Japan and the U.S., explains some of the unique aspects of Japan's criminal justice system, and discusses the prospects for change. Click here to listen to this latest podcast. You can listen to the podcast now or download it for future use. This podcast is the 19th in our series, DPIC on the Issues. See more below.